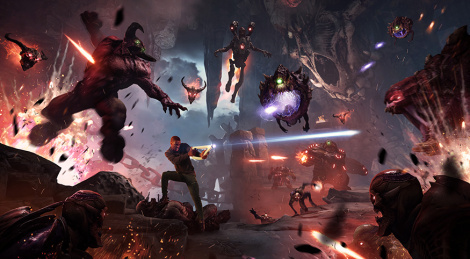 HTC Vive and PlayStation VR owners can now experience id Softxware's frenetic shooter as DOOM VFR launches officially today. So far the game is pleasing. I expected to be amazed by the graphics and disapointed by the gameplay but i end up a bit disapointed by the graphics* and enjoying the game a lot. I encountered a green hair bug on corpses and a gore nest not exploding properly with sound sync but other than that it works well. All in all i'd say it's far from on par with the main game it's tied to but worth it's price. It came with adynamic theme of the argent tower playing the BFG Division theme for the Ps4. Good to hear. People were already spreading conspiracy theories tying the port's short absence to the Carmack/Bethesda legal dispute.